Over the weekend I've been busy and made the my first modification for the Aerofly FS 2 Flight Simulator: a cold and dark capable Cessna 172 mod. Not only can it do engine start/stop, you can also set the master battery, alternator and avions to off and enjoy a dark cockpit. Plus you can turn off individual panels like the COM1, NAV1 panel. I also included a lot of small gimmics like opening doors and windows (they create drag when opened in the air) and also moveable sunshades. Almost all instruments in the cockpit are now working, including fuel flow and egt and so on. Their indications are faked at the moment but I am sure you could improve them a lot if you put in more time and effort. I was really impressed that all these things are possible in the Aerofly FS 2 and it wasn't any harder than I was used to from the previous Aerofly simulators. 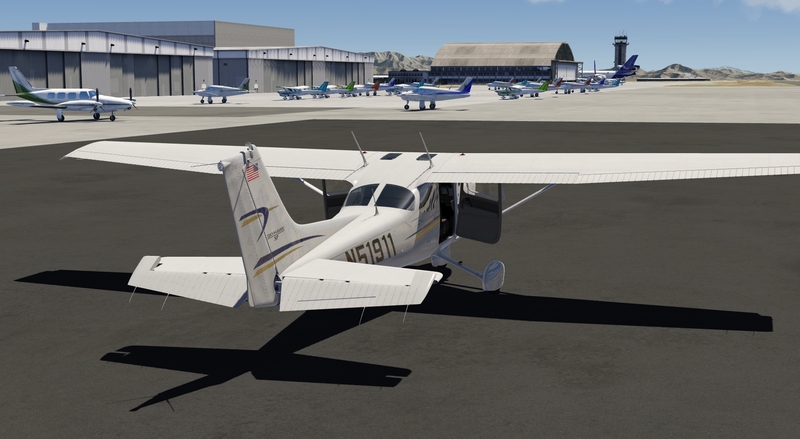 This mod only requires the Aerofly FS 2 Flight Simulator Steam edition to run and I will try to update this Cessna mod for future version that will come. Edited once, last by Jet-Pack ( Sep 16th 2016 ). there you go, first global add-on. Thanks Jan for sharing. seems mixture stab and most controls work with scroll wheel and not with mouse click? I also wanted to ask you for a favour. Can you find out how to get the mouse view working without holding the button? and the scroll wheel for zooming. it works when in exterior view, but not inside. Why would you want to click the mixture? Click and drag maybe but that is not yet implemented in Aerofly FS 2. The mouse control in the cockpit cannot be changed by the aircraft files. IPACS will need to change that, its out of the range of outside developers. - Does mixture actually work requiring leaning with altitude ? - Is it possible to, either through config file editing or SDK, modify temperatures, pressures, cloud cover, time of day / date ? And, regarding temperature and pressure, does Aerofly model density altitude ? - I believe in the present version there is no fuel consumption, but I wonder if the necessary hooks are available for more detailed modeling of fuel systems, starting with basic fuel consumption, and affecting weight & ballance ? Does mixture actually work requiring leaning with altitude? As mentioned on the download page: no. - Is it possible to, either through config file editing or SDK, modify temperatures, pressures, cloud cover, time of day / date? Time of day has a slider in the simulator settings and a key assignment ("T" and "Shift+T"). Temperature is standard ISA, I've not seen any setting for that yet in any config file. Same with pressure. And, regarding temperature and pressure, does Aerofly model density altitude? Air density, pressure and temperature in the Aerofly reduce with altitude. That is such an important feature, its just a matter of time. Currently you could accumulate the fuel used by the engine and kill it at some point, you could shift the center of gravity but you can't make the airplane lighter yet (except dropping a finite mass). Temp and pressure do not cover humidity effects on density. N2 MWt is 28g, H2O MWt is 18g. The humidity difference across warm sector boundaries can be significant. I have the mod installed and running, I can remove the virtual yoke etc. I understand there's not yet a possibility to start cold and dark. However, I tried to switch off the engine after landing. I switch the starter to off - engine still running. I switch the Master off - the propeller is still rotating. Only pulling the mixture lever fully out using the mouse does stop the engine/propeller finally. Is this some mistake by me or some kind of bug or limitation? Switching the master off should theoretically not stop the engine I think. thanks for looking into it. Yes I turned the magnetos using the mouse wheel to the left, too. I didn't opt in for beta yet because of a warning re Win10 64 somehere, maybe that's the difference. I'll look into it again after the new code was officially released. - used fuel simulation and electical system of the latest Aerofly FS 2 Simulator to its fullest, a lot of code could be simplified because the simulation is now taking care of most of the logic needed. This might not be the correct thread but is it possible to completely remove the map display in the c172. I like to rely on traditional navigation equipment NAV, ADF and such. If not, at least could you make it a real GPS unit. Now it is just some sort of map. Does not belong in a C172. the display on the right should be off. This mod sounds fantastic. Do you plan to make it even for the other planes? It would be awesome. There's only one way out of here. Piece by piece. Thank you for that mod. It seems however to conflict with Saitek Panels, which are now supported by AFS2. Without the mod they work almost fine, moving switches and radios. Interesting because I did not change the switches around as far as I remember. Are you using the latest Beta of the Aerofly FS 2? The only thing that I added again to the default version is the ability to turn off the engine. Which switches are not working anymore for you? Thank you. After some testing, it seems the Saitek driver is somewhat unstable in my case, nothing to do with your mod. Amazingly enough it works very well in the Aerofly FS settings menu, where every switch can be checked, but once the aircraft is loaded the radio panel sometimes remain dark, both with or without your mod. BTW nothing to do with rpm, you don't idle avgas engines, or you quickly foul the plugs. You always keep some 1'000 rpm when on ground (except for idle check) which is well enough for the alternator to load. Tonight I could make my radio and switch panels work exactly the same with or without your mod. Except 1 small bug (COM1 standby switches both COM1 and COM2 – nothing to do with your mod, I have the same without), only a few switches in the Cessna 172 can be operated from the panel (mostly lights). Magnetos key, battery main, alternator, avionics, fuel pump, etc. cannot be operated from the panel, although in Aerofly FS setting menu they are properly assigned and recognized as such by Aerofly FS. Looks like in the mod these switches can be operated with the mouse only... Do you think there is a chance in a next release to have these switches linked to those defined in Aerofly FS Saitek panels menu ?